(1808-75) Congressman, Senator and Governor of Tennessee. He was nominated and elected vice president on the Union Republican ticket in 1864. Upon Abraham Lincoln's assassination in April 1865, he became our 17th president and resolved to follow Lincoln's plans for reconstruction without bitterness or malice. His reconstruction plan clashed drastically with that of the Radical Republicans in congress, and Johnson's term was one humiliation after another, culminating on Feb. 24, 1868 with a resolution of impeachment against him. This failed by one vote to pass, and he served out his term. Wet plate, albumen carte de visite photograph, mounted to 2 3/8 x 4 card. Bust view pose. Backmark: Morse's Gallery of the Cumberland, Nashville, Tenn. Light horizontal crease below the subject that is hardly noticeable. 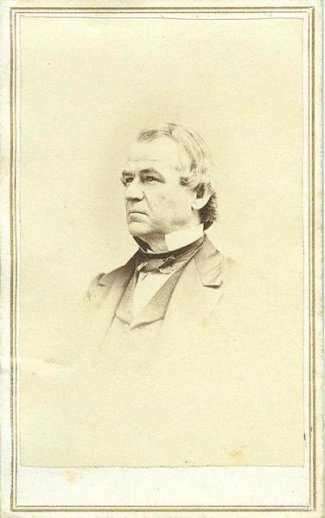 Scarce imprint for an Andrew Johnson image.